This was annoying. It was fun to make the room. But I had to buy pro in order to make another room. So if you don’t want to buy pro you can only do one room and it’s annoying. I think that this game is great!! 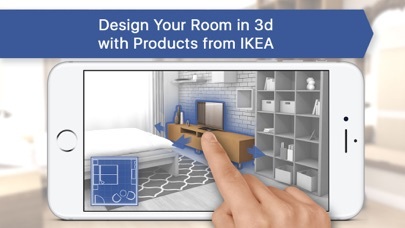 But I think that if you don’t have the part of the app were you can make as much rooms as possible then it can be very boring. It’s a really good game but the update isn’t really good most of the things now are basically pro but before the update the things that are now updated used to be mostly non-pro so I really want my old app back. I like it but it’s slightly misleading. I personally just use it to have fun and decorate- but if you are looking to design your own home layouts, and get most of the products, you need to pay $5 a week. Now don’t get me wrong, there is still a lot of stuff to choose from with the free version, the best part, I’d say is no ads. I had some difficulty with an iCanDesign app and got an immediate, thorough, and kind response from the app designer. This app is easy to use and has great 3D views. Helps me envision my future room. Also not super hard to use. 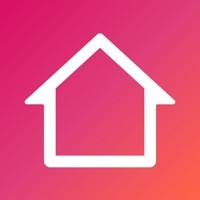 As a game dev - and someone who lives near an Ikea and will be moving soon - this app is great! I use it to plot out level designs and I’ll definitely use it to help design my new apartment when I get there. Totally useless if you are trying to see if specific IKEA furniture pieces will fit in your home. After you spend money, you learn the furniture options are from years ago & not the same items are even available. Total waste of time & money!!!!! I’m mostly upset about the time I wasted setting the specs of the room for no purpose. Complete BS on the description of what can be done in this app. The app is great but, you can only do one room in total no matter what room it is. The app used to be great until the recent update where nothing is free. You have to pay to use the app... I looks free but isn't! I’ve made a single room and it’s telling me I have to pay to make another one. Not cool. I really want a loft bed but I don’t know if it would fit in my room, so I downloaded this app for that. The app doesn’t allow me to use the exact measurements unless I pay real money which makes it impossible to do what I was trying to. Because of that this app is completely useless to me. Also I wanted to make another room but apparently my 1 room is the limit which is ridiculous. If you could fix these in the next update that would be awesome. This is a great game. I love designing my own rooms. Definitely worth downloading.5 star rating. This app is basically unusable. You can manually create a floor plan and add 2d objects viewed from above. Or you can look at their preset rooms and edit them. Not very useful for planning or designing your own space. And you earn points? 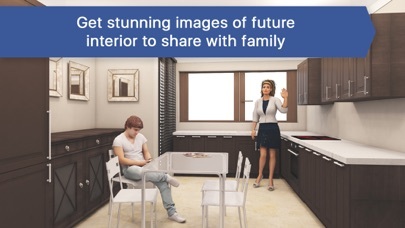 I think this is more of a sim game for room planning than a useful tool for remodeling. I’m moving in a few weeks and this has made my decision making much easier. I can take similar sized items to my own and build the room according to my future floor plan. Depending on what fits, I can choose which furniture to keep. Thank you for this app! so i got this app because i’m very interested in interior design and wanted to try designing a house. apparently you have to spend money (monthly, yearly, or weekly subscriptions) to design multiple rooms! 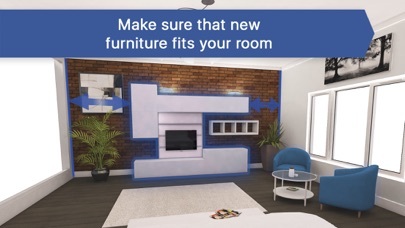 you have to pay the subscription of your choice to design multiple rooms. not to mention the fact that your limited to certain furniture and colors!! i decided to write a review because i do look at reviews before i get an app and i hope i helped some of your decisions. this app is not worth your time! it is fun to design to me and i do really like how the creators have the app set up but i’m really surprised and upset you have to pay. So Im saving up to get my own room and Im the kind of person who likes to plan ahead so I downloaded this app and made my dream bedroom. I soon realized that I could make one room. I could only make one room unless I bought the stupid pricey pro version. Do not download unless you want to waste your money making more rooms without deleting other rooms. I'm very disappointed. 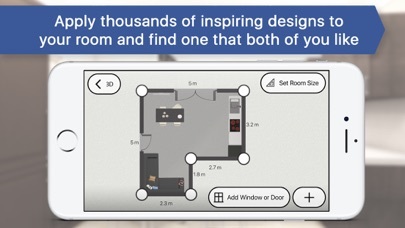 While browsing the App Store for a room layout app this one looks good because of a high number of positive reviews. It is a scam because, unless you pay to subscribe to their “pro” version, this app is useless. I can only assume that there is an offer made eventually to discount the “pro” version in exchange for a five star review. There is no other way that this app could actually earn the rating it has. I tried a simple task, designing a small 5’ x 6’ bathroom and it isn’t even possible to set wall sizes making it useless. I don’t mind paying for an app if it is made clear before download exactly what the cost will be. Avoid this app.